Evangelist Laston Bissani prays for the Communion bread. Photo: courtesy of Laston Bissani. He is quiet and unassuming, gentle and humble in disposition. But, when he is addressing the church, he commands attention. He sings and dances with vigour and energy that belies his nearly 60 years. This is Laston Bissani Mitambo, an evangelist who has planted many churches in the Palombe District in Malawi and in the Zambezia Province of Mozambique. He married Eniles in 1979. Eventually, the family moved to Blantyre, where he worked as a tailor. That is where he received Christ 11 January 1986 during a street-preaching episode. He learned about the love of Jesus, little by little, until he was moved to repentance and salvation. His brother who attended a Brethren in Christ Church introduced Bissani to this church. He grew in faith there, and served as treasurer. In 1990, BICC Malawi appointed Bissani as national evangelist. 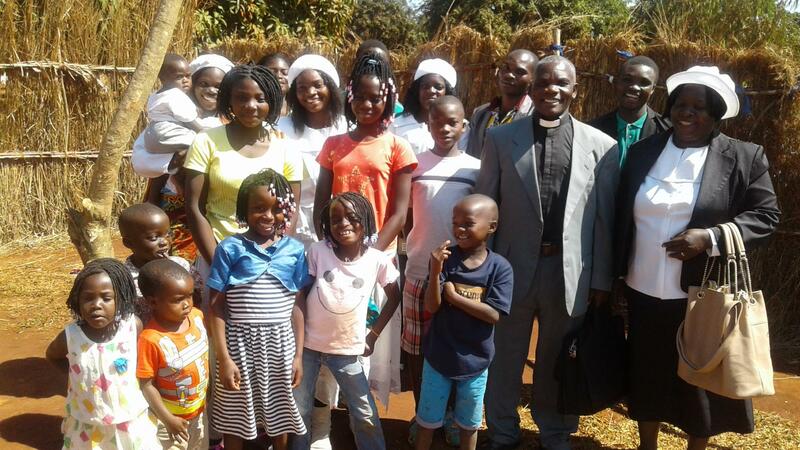 After Bissani’s studies at the Evangelical Bible College of Malawi, BIC Malawi sent the newly ordained reverend to Mozambique in 2003 to grow the Malawian church in the Zambezia Province. But one day Malawi BIC had no more funds to support church planting work. What would Bissani do back home? His heart wanted to carry on evangelising in Mozambique. He remembered that the Apostle Paul was a tent maker. Using his skills as a tailor, Bissani could support his family while he did the work the Lord had called him to do. Bissani now receives a quarterly allowance from BICWM that complements what he gets from his tailoring business. Eniles died of cancer in 2009. Bissani married Carlotta, who was with the BICC in Beira, in 2010. A recent graduate of a four-year Theological Education by Extension (TEE) course, Carlotta “has been a great wife and partner in ministry.” Bissani and Carlotta have one son together in addition to his eight children with Eniles. Currently, with support from the BICC administrator in Mozambique, Bissani trains church leaders who come to Milange for seminars on leadership, salvation, the Holy Spirit, Christian life, evangelism, church planting and ecclesiology. —A Mennonite World Conference release by Barbara Nkala. Barbara is the MWC regional representative for Southern Africa.